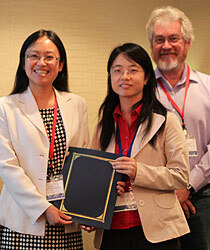 Dr. Yan Sun (left) receives the IEEE SocialCom 2010 Best Paper Award with co-author Yuhong Liu (right). ECE alumna Dr. Yan Lindsay Sun, (Ph.D., E.E., '04) received the Best Paper Award at the IEEE International Conference on Social Computing (SocialCom 2010), which was held August 20-22 in Minneapolis, MN. The title of the paper, co-authored by Yuhong Liu, was "Anomaly detection in feedback-based reputation systems through temporal and correlation analysis." Social Computing can be broadly defined as computational facilitation of social studies and human social dynamics as well as design and use of information and communication technologies that consider social context. Social computing has recently become one of the central themes across a number of information and communication technology fields and attracted significant interest from not only researchers in computing and social sciences, but also software and online game vendors, web entrepreneurs, political analysts, digital government practitioners. SocialCom 2010 provided a key forum for researchers and industry practitioners to exchange information regarding advancements in the state of art and practice of social computing.